Which bookie to bet with? The advent of Internet has really revolutionised the sports betting market. There are thousands of online bookmakers out there, each one offering unique bonuses and offers, sometimes even on per match basis. These offers can be particularly exciting when you sign up and bet with a sports book for the very first time. You should select your bookmakers very carefully after carrying out a thorough comparative analysis. The current form of a football team can tell you volumes about what can be expected from them in their upcoming matches. Any team experiencing a losing streak of four or more matches may not be in the best mental shape for their next game. On the other hand, a team that’s been on a roll lately, would do everything within its ability to keep the momentum going. A good thumb rule is to consider a team’s performances in its last 3 to 5 matches. Looking any further may not be of much use. While you’re doing such study, also ensure that you consider the away as well as the home games. Unarguably the most important information you must pay heed to, the head to head performance, combined with the current form of the two teams, can tell you a lot about their chances. You can look at their games of the previous season, as much wouldn’t have changed in one year. Team morale or the current motivation level of a team is another important factor that must be taken into account. It’s normal for players and teams to push themselves extra hard when they are closing in on the final stage of a football season. The players don’t mind going the extra length to achieve a higher spot on the league table. It’s not unusual to see amazing performances from underdogs during this stage either. In case a football team is participating in many different competitions simultaneously, for instance, in the National Cup as well as some international competitions, its players may be fatigued and not entirely ready for the next game. Hence, the coach of the team may choose to bench some of the key players, so as to avoid any injuries. You can lose plenty of money on your punts if the key players of the football team you’re backing don’t make it to the starting line-up, owing to some injuries. Almost every football team can find it hard to cope with such loss as their goals often come from these star players. So, you should stay constantly updated about any such happenings and place your bets accordingly. This entry was posted in Arsenal News on October 4, 2017 by Admin. 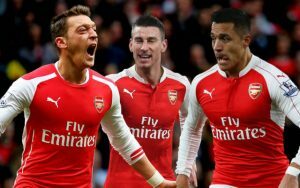 Another point to consider is …… We don’t know if Wenger will at long last employ different tactics against different teams (eg. Chelski) as necessary. He may revert to his insane belief that his beautiful football will and must play top teams off their own pitch ! How badly this ideal of his has cost us over the last decade of stagnation and decline.